Dr. Joby John is the newest dean for the B.I. Moody III College of Business Administration at the University of Louisiana at Lafayette. He replaces Lewis Gale, who left UL Lafayette in 2004. Business faculty members – Ellen Cook and Paula Carson – both served as interim deans. Most recently, John served for eight years at the rank of full professor as Chair of the Department of Marketing at Bentley College, one of the largest private business schools in the United States, located near Boston, Massachusetts. Prior to joining Bentley in 1986, John was an instructor at Oklahoma State University during his doctoral program in business administration. A native of India, where he earned a B.S. in Pharmacy and an M.B.A., John worked for Pfizer and for British American Tobacco. His current research interests are in the marketing of services, customer-focused management and cross-cultural interactions in services. John has published about 40 research papers and three books including Interactive Services Marketing and Fundamentals of Customer-focused Management: Competing through Service. He has lectured in a dozen countries and has participated in USAID grants in Europe and North Africa. John is on the editorial review boards of four journals, and has served as President of the Boston Chapter of the American Marketing Association and as Chair of the Services Special Interest Group of the American Marketing Association. “ As I begin serving as dean, I am struck by the commitment and dedication of the faculty and staff,” John said. He wants to work with faculty members on the college’s direction, and he is exploring relationships with other colleges in the university concerning cross-disciplinary curricular and research opportunities. “ I am also particularly impressed by the very strong alumni and community relationships with the college and university,” he said. John plans to meet regularly with the business leaders in the community to determine how the college can help shape the future of the greater Lafayette region. The B.I. Moody III College of Business Administration is organized into five academic departments, offering nine majors for the undergraduate business degree. It also offers the graduate business MBA degree with an option to concentrate in Healthcare Administration. 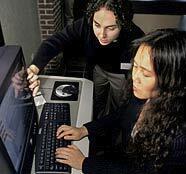 Accredited by the Southern Association of Colleges and Schools (SACS) and the AACSB International accreditation programs, the College is included in the 2007 edition of Princeton Review's Best 282 Business Schools. In addition to the traditional business majors, the College offers unique curriculum choices including majors in insurance and risk management, hospitality management, and professional land and resource management, as well as minors in francophone and Hispanic language and culture. The College is housed in Moody Hall, a state-of-the-art facility, complete with smart classrooms and labs providing an advanced-technology learning environment.